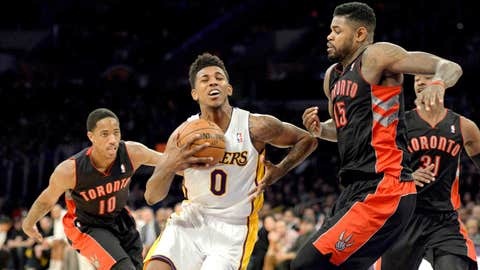 Maybe Nick Young’s skill set would be better used in an AND-1 street-ball game and not the NBA. Sunday night marked the return of the Black Mamba, as Kobe Bryant played in his first game for the Lakers since tearing his Achilles in April, but the Lakers came up short against the Raptors. Young was trying to help his team come back from a seven-point deficit in the fourth quarter when he absolutely bricked an attempt at a flashy 360-degree layup. Young received the ball low in the right corner and attacked along the baseline, before launching into a 360-degree spin move around Jonas Valanciunas toward the far side of the hoop. Young threw a one-handed scoop shot toward the hoop, but the ball ended up flying high above and bouncing off the backboard — much to the amusement of the Lakers’ broadcast team. Young finished the game with a team-high 19 points, three rebounds and two assists in 30 minutes played. Check out Young’s failed 360 attempt in the video below.